In this section, I’m going to briefly introduce a practice I’ve found helpful in better integrating my ‘story’ and ‘un-story’ self, which in turn has helped to stay engaged in even the most difficult conversations. Let’s go through it, and you can see if it has value for you. Let’s begin by stepping back a moment and recapping the two aspects of our “self” that we’ve been talking about. There’s our "story self," which is, broadly speaking, characterized by a limited or restricted sense of belonging — my people, my tribe — leading to "us vs. them" thinking; a view of the world shaped by past experience; and a self-pre-occupied, inward orientation. 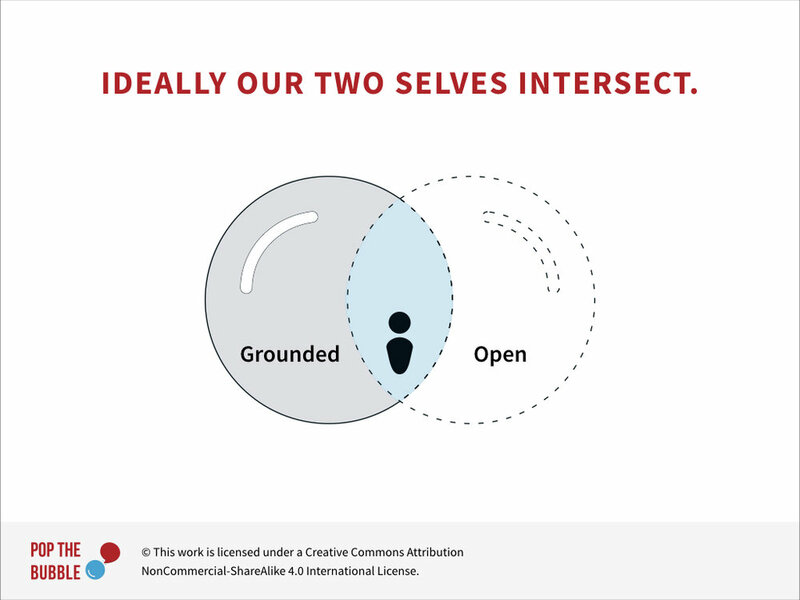 In contrast, our ‘un-story self’ is characterized by a limitless sense of belonging — we’re all in this together — or "us and them" thinking; the ability to be responsive to the present moment, unencumbered by the past; and a self-abandoned, outward orientation. I want to emphasize that both selves are us. 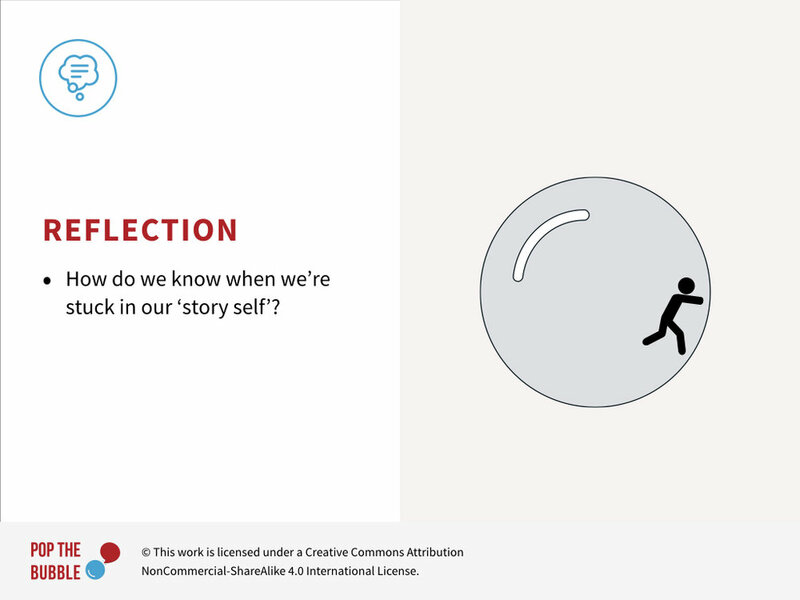 We may identify more strongly with our story self (that’s the problem! ), but it’s important to remember they together comprise our WHOLE self. Where we get into difficulties is when we’re “stuck” in our story. That’s when problems and conflicts arise. Feeling threatened, unable to detach and take in another perspective, we’re susceptible to fear centers of our brain, and the debilitating effects of an amygdala hi-jack! So if we want to engage in difficult conversations, here are two critical questions. One, how do we know when we’re stuck in our story self; and two, once we’re stuck, how do we get out? How do we know when we’re stuck in our story self? What are the signs? It’s common to feel like we should resist things we think are “wrong,” and our resistance is what compels us to act. But do we need to pair resistance with the perception of wrongdoing? Consider this example. We can all see this equation is not true. There’s no problem of perception here. Does this statement make anyone angry or upset? I’m going to assume not. It’s just objectively wrong. And our lack of resistance doesn’t mean we can’t or won’t want to respond. If fact, because we are not in a state of resistance, we’re free to be pretty creative in how we might point out and correct the error. Let’s take a moment to personalize this discussion. Is there a relationship or situation in your life where you ‘re experiencing resistance? Where things are not going “your way” and you’re upset/unhappy about it? How is being resistant helping you? How is it hurting? Let’s turn to the second question. Once we’re trapped in our story self, how do we get out? It’s probably obvious by now, but I’d like to propose we get free by surrendering or letting go of our resistance. Surrendering our resistance toward “the other” — be it a person, action, or philosophy — is the surest path from our ‘story’ to our ‘un-story.’ So simple, so hard! As we’ve discussed, resistance activates our amygdala and weakens the connection with our prefrontal cortex, limiting our ability to reason and function wisely. When our amygdala is in charge, we have a very small repertoire of available responses: fight, flight or freeze. When we free ourselves from resistance, we create the space and freedom to discover a wide range of options beyond fight, flee or freeze. Having calmed the fear centers in our brain, our higher level cognitive functions kick back into gear, which in turns clears our perception, widens our field of view, and opens us to new possibility. I want to emphasize: It doesn’t mean we surrender the right to take action. We don’t let go of our power of discernment, our ability to distinguish right from wrong. What we surrender is the impulse to object, condemn, dehumanize or blame. And when we do that, new options emerge. 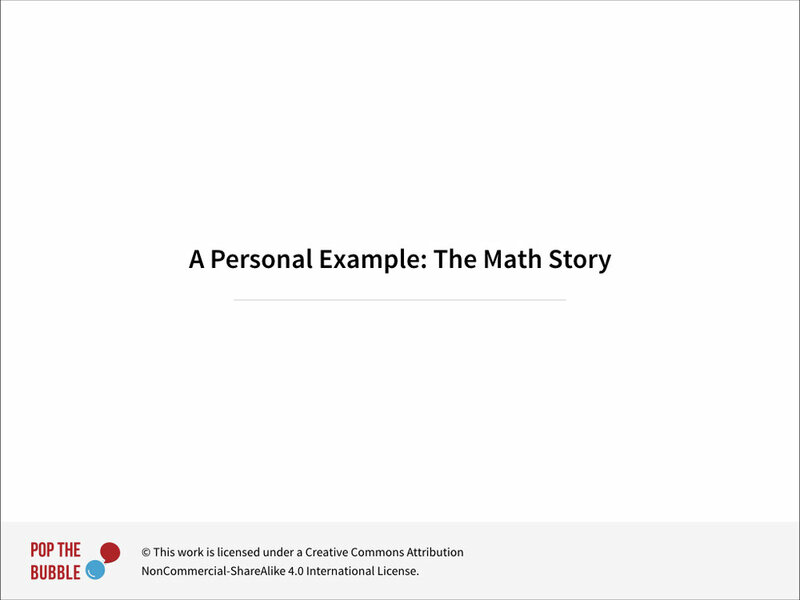 I call it the math story. Turns out, sometimes 2 + 2 = 5 is upsetting. When I was in third grade, I was having a hard time with math. My mother, an elementary school teacher, and my father, a mathematician, had little patience for my difficulties. Their efforts to help me would follow a set pattern: They'd get exasperated, then angry and once or twice they would end up slapping me for being so dense. It was, needless to say, a traumatic experience. To this day, I freeze around math problems! I knew what was going on. (And this is why it is so important to know our own story!) I knew what had gotten hold of me: An old pattern of how my parents treated me. And through what felt like enormous willpower, I calmed down. I said to him hey, let's just set this problem aside and come back to it later. Uttering those words felt like a death of sorts. The emotions I was feeling wanted so desperately to be expressed, and I was telling them no! 15 or 20 minutes later, we did come back to the math problem. He had calmed down and so had I, and we sailed right through his homework. It was an incredible experience. Afterward, I walked into the living room where my wife was reading. There were tears in her eyes. She knew exactly what had happened; a pattern that could have gotten passed on to another generation was, in that moment, broken. I used weaker brain circuits to overcome more powerful ones. Many times I have not been successful in winning that battle. But every time I was successful, I became a little more conscious, and my interactions with the world a little more positive. So it's always a battle worth fighting! So here is the key point: When we’re in resistance to a reality, we’re unable to creatively respond to that reality. Remember, resistance diminishes our ability to take in new information or see new possibility. 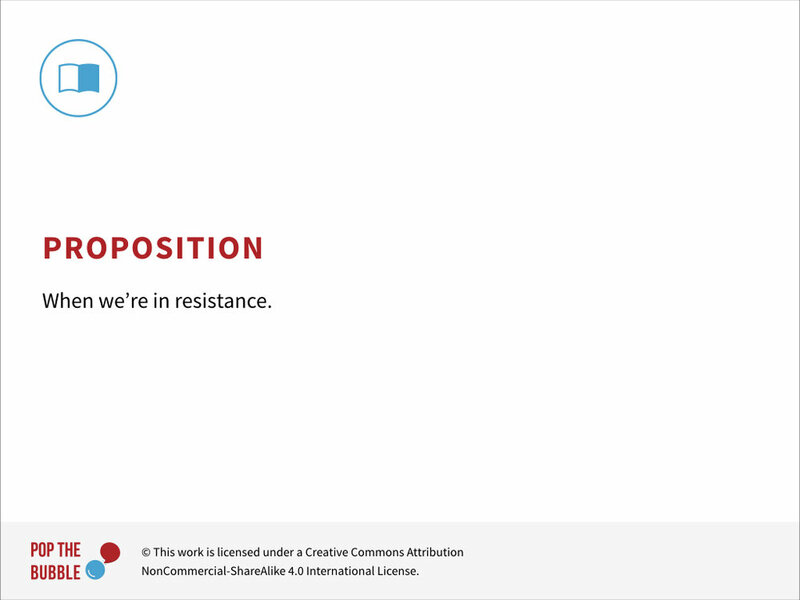 It also tends to evoke resistance from whoever we’re resisting*! Remember Newton’s third law: For every action, there is an equal and opposite reaction. We get locked in a negative spiral, closing off possibility. Surrendering, on the other hand, opens up possibility. Surrendering our resistance “cancels out the boundary” between our story self and our un-story self, so that integration is possible. 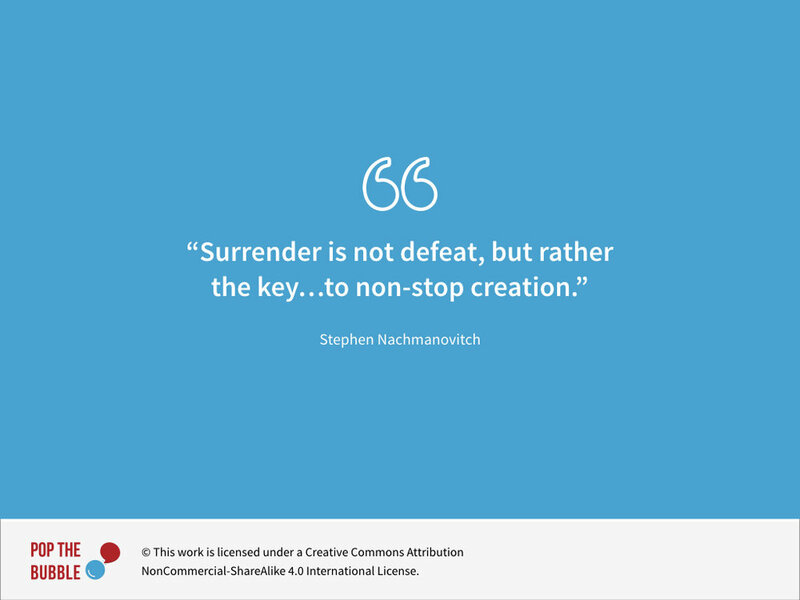 When we let go of our resistance, we invite in our un-story and unlock tremendous creativity. If resistance is so debilitating, and surrender so freeing, then why is surrendering so difficult? One reason is that to our “story self,” resistance feels good. It creates the illusion of control. Like a drug, it momentarily strengthens or puffs up our identity. It makes us feel powerful and gives us the illusion of agency. But all we’re really doing is doubling-down on what created the problem in the first place: Holding on to our story. And rather than giving us agency and control, it does the opposite. It increases our vulnerability by diminishing our ability to respond. Resistance puts our amygdala in charge, giving us a very small repertoire of available responses: fight, flight or freeze. This is not to say that resistance is bad! Resistance is feedback, telling us there’s something in our story that’s been triggered, activating our fear centers and preventing us from taking in the reality of what’s in front of us. It’s an indicator that we need take a step back, to reflect on our story and the specific source of the trigger. By doing so we can regain perspective so that our survival drive calms down, we can take in “the other,” and discover new ways to respond. In contrast, surrendering or letting go of our resistance has the opposite effect: it creates the illusion of vulnerability. If we let go of our resistance, we fear that whatever we’re resisting will walk all over us. Take over. Even destroy us. But again, the actual outcome is just the opposite. When we free ourselves from resistance, we create the space and freedom to discover a wider range of options beyond fight, flee or freeze. Having calmed the fear centers in our brain, our higher level cognitive functions kick back into gear and if the threat is indeed real, we’ll be more creative and effective in dealing with it. When we surrender our resistance, we’re changing our brain. It’s not easy. But the wonderful thing is we’re designed for it, thanks to an amazing feature of our brain called neuroplasticity. Neuroplasticity is the brain’s ability to grow new neurons and rewire itself, and it means we are wired for change. The brain can grow new neurons and rewire itself throughout life.. But it means that we have to use weaker circuits in the brain, rather than stronger ones. That’s why it is so hard and why surrendering can feel a little like a death. We’re actually letting old patterns die so that new ones can be born. It’s hard because many of our patterns are deeply entrenched — some tracing back to our formative years. Many at one time in our life served us, helping us adapt to a particular place, time and circumstance. But place, time and circumstances change, and we need to be open to those changes, and to have the ability to let go of the old, and embrace the new. Let's look at one example of someone who decided to surrender his resistance, and to change old patterns. It’s a wonderful example of the struggle between the old, strong neural patterns and the new and weaker patterns, as he gives voice to the impulses of each. It’s from The PBS Newshour which occasionally has a segment called In My Humble Opinion. It's a chance for people to share their thoughts on various topics. This one is by novelist Akhil Sharma, a professor of literature at Rutgers University and a contributor to The New Yorker magazine. It's just under three minutes. Let's watch. So let’s think again about a relationship or situation in which you’re in resistance. 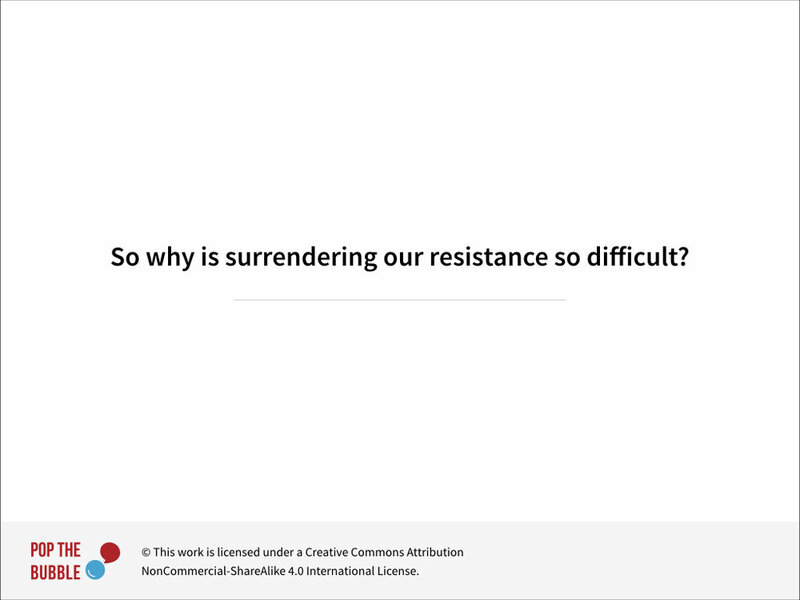 In this instance, what would “surrendering” your resistance look like? How might doing so help you and/or the situation? And finally, what “weaker circuits” might you use to overcome the stronger ones? Thank you, everyone, for your thoughts and engagement with this. Thank you, everyone, for your thoughts and engagement with this. It’s time now to summarize and wrap things up!